Meant to add this oddity as well. I realized how poor of condition the original pen body was in after receiving it and one of the tines had lost its tipping material. However, I have never seen another reference to the Kendrick Bellamy company anywhere else. The best reference I can find is that Kenrick Bellamy was once a book seller in Denver Colorado. From what I could find, it was apparently a rather large company as well, supplying books and goods to many on the western frontier. A shame about the nib. 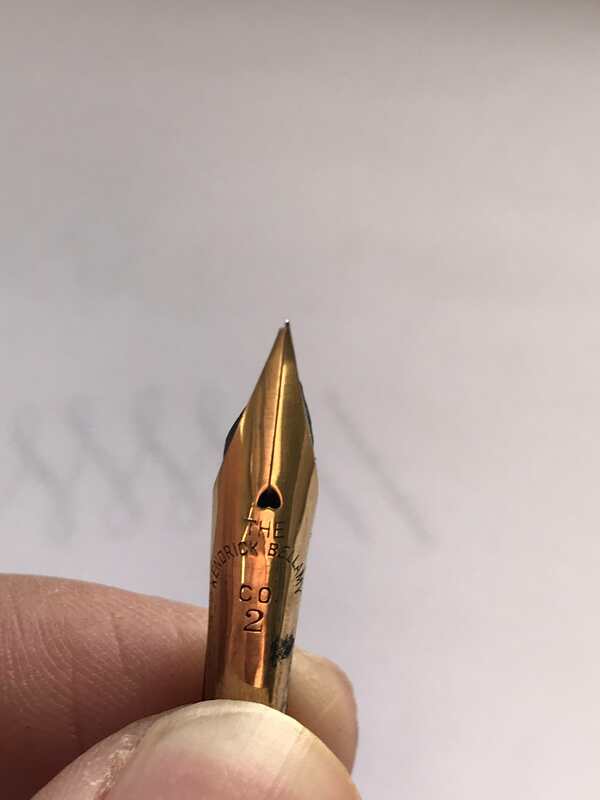 It's a beautifully flexible nib, but that missing tipping, plus the fineness of the gold, means that unless I want to fork out more than the value of the nib or pen to get it repaired, it will have to go on unusable for now. Jon, even though you just have to keep it as part of your collection, I think you have done this nib a good service. Thanks to you now it has a bit more exposure. Not until we see these obscure brands that we realized how much ingrained in societies all over the world fountain pens were in the past. And to me, it's endlessly fascinating. Putting my restorer/geek hat on, that nib looks awfully like an old Conklin Toledo nib. Something about its proportion seems familiar to me. Hmmm...Interesting. Now that you mention it, it does look like a Conklin nib. I wonder if, at a time, Conklin might have produced nibs as a specialty sub-brand run for the Kendrick Bellamy book shop? Now I want to find a Conklin to see if I can fit the nib into it. That would be compelling to get the nib retipped. Last edited by AzJon; July 27th, 2018 at 11:09 AM. But... we are inside of our enclave here at the FPGeeks, aren't we? I agree that no one who is not into FP writing or collecting would even give a hoot about obscure brands, but it seems that this thread has grown into a very educational one. At least for me. Oh, no doubt... and i don't disagree with asking the question; but as Jon observed obscurity is very relative and beyond a certain threshold there are many equals in the field of gross obscurity. Another question though, which is the most obscure pen - from both well known and obscure makers? Obscure French brands: Matcher Colombes, Stylochap (goes with Oldchap, but I'm never sure if they are the same company or not). Brands from God knows where: Talisman, Acorn. All four are 1930s / 1940s. I'd love to know more about them if anyone has any ideas! I am really enjoying this thread. 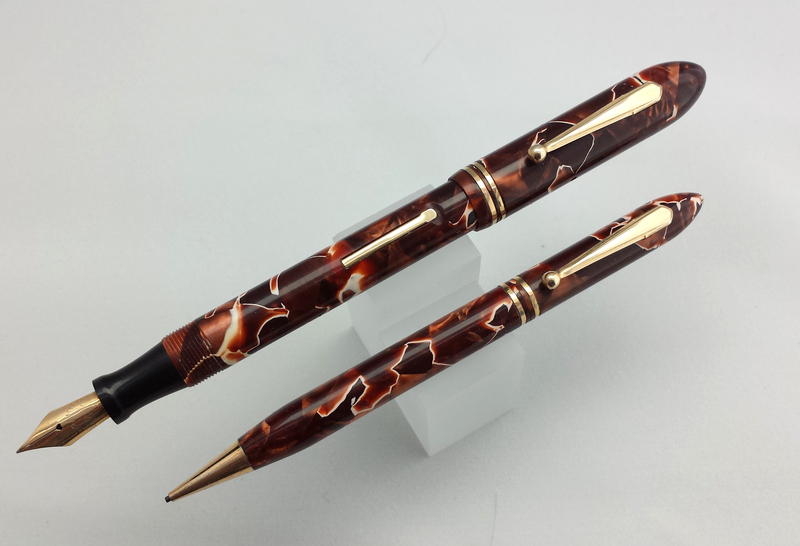 Some great and interesting pens I would never have seen otherwise. I may have encountered a Stylochap, but not the other three. Never heard of Acorn or Talisman, sounds like British pen brands, doesn't it? Acorn pens and stylos were made by Jewel in London. I think the Talisman is Continental, maybe French. It's a quality piston filler, or at least the ones I've seen are. Go to the advanced editor for uploading options. If you use the quick reply, hosting links are the only option. Use the manage attachments option under the "Additional Options" box that is below your reply box. Click "Add Files." When you see your image in the catalog. Drag the image you want to the lower attachments box. Click the insert Inline button at the bottom of the dialog box and you will see your picture files listed under the Manage Attachments button in your reply page. This is the Wembley Pen. This was the cheap Bic of its age and like Bic pens most were just thrown away so very few survived to be seen by modern people. These sold for one shilling when an Onoto cost 30 shillings. This may step a little outside of the thread title if for no other reason that it's an example where the brand isn't just obscure but unknown! I've posted this set before, but I'm sure a lot of people have found pens from the golden eras that didn't have any branding or provenance, and this set is like that. 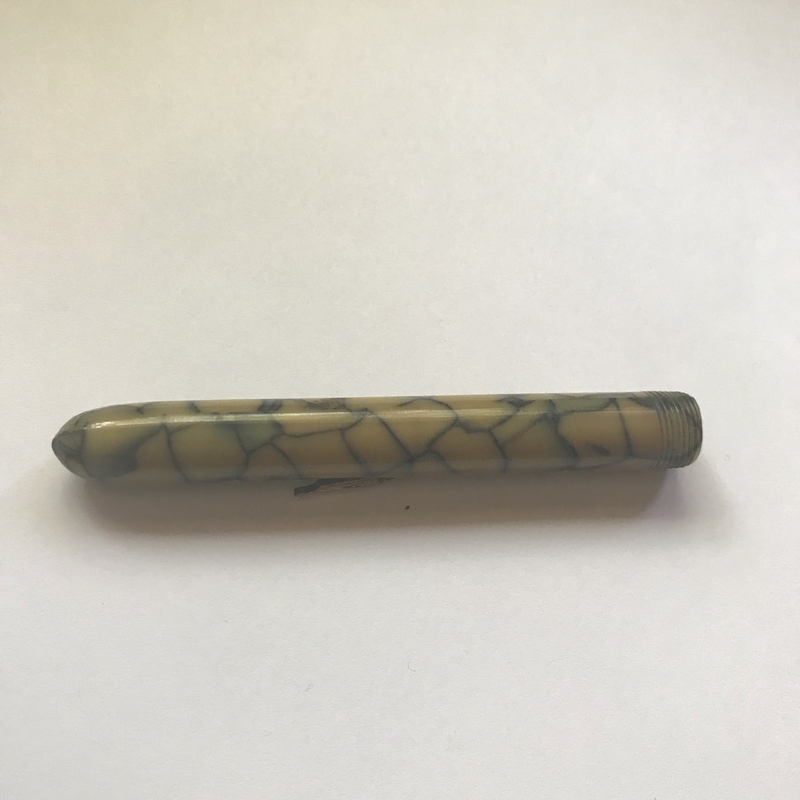 Absolutely no markings anywhere that would indicate original manufacture, in spite of the fact that it is moderately high quality and a nice material. I may have show this here on FPG before; I got some good info in a now-defunct Facebook group and not certain if I can ever find it again, but it is a set worth including. That is an absolutely gorgeous set! Just beautiful. Jon, that looks very similar to a celluloid used by Bayard in France. One of my favourite patterns! It's the thin white line that really makes it ping. One day I must get round to doing a celluloid/brand matching exercise and trying to work out which factories were supplying which brands. Deb, thanks for the info on Acorn - I picked the pen up in France, like the Talisman, so either they exported, or someone bought it on a trip to London. That is cool that you have a survivor in such a good condition. That is quite ... electric!